1909, 13¢ blue green, o.g., never hinged, beautifully centered amid large well balanced margins, rich intense color and remarkable freshness, Extremely Fine to Superb, a wonderful gem, with only eight examples grading higher; with 1998 P.F. for block, 2010 P.F. (Graded XF 90 XQ) and 2010 P.S.E. certificates, the latter Graded (XF-Sup 95, SMQ $675). 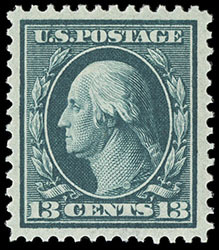 1908, 1¢ green, vertical coil, line pair, o.g., never hinged, each stamp exceptionally centered amid evenly balanced margins, strong bright color and exceptional freshness, an Extremely Fine gem, an outstanding line pair. 1909, 5¢ blue, vertical coil, o.g., lightly hinged, perfect centering with beautifully balanced margins around, deep intense color, a Superb jumbo, the only example to receive this grade with only one higher; with 2017 P.S.E. certificate Graded (Superb 98J, SMQ $725 for 98 and $1,150 for 100). 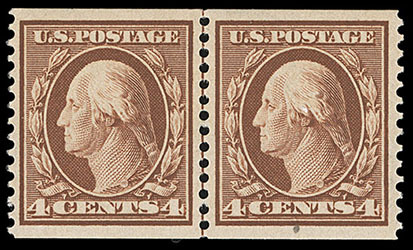 1909, 4¢ orange brown, horizontal coil, line pair, o.g., lightly hinged, wide margins and choice centering, rich color, right stamp with small natural paper inclusion at bottom (cert calls perf indent), Very Fine; with 2018 P.S.E. certificate Graded (VF 80).